We thought we were getting the AirPods 2 when Apple announced a new version of the true wireless buds...but it turns out, we've only got the new AirPods (2019), an updated version of the originals. While the AirPods (2019) do sport some cool new features like the ability to charge wirelessly, they aren't the AirPods 2 we were hoping for. 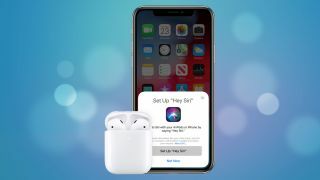 According to Apple, the current 2019 AirPods deliver "faster connect times, more talk time, and the convenience of hands-free Siri." While we were impressed by the fast pairing times when we tested the updated AirPods, there are still quite a few new features that we are expecting to see from the AirPods 2...when they finally come out, that is. When are they out? Our best guess is early 2020, but nobody knows for sure. How much will they cost? We'd expect them to be similar to the AirPods (2019), which start at $159 (£159/AU$249). Now that Apple has released an updated 2019 version of the original AirPods, we're not expecting the AirPods 2 to be coming out any time soon. Back in 2018, tech analyst Ming-Chi Kuo predicted that the an improved pair of the true wireless buds with support for wireless charging would arrive in 2019, to be followed by a major upgrade in 2020, with an all-new design. So, could these be the AirPods 2 we've been waiting for? So far, Kuo's predictions have been pretty accurate, right down to the AirPods 2019 connectivity upgrade, so we're betting on an early 2020 release for the AirPods 2. We originally expected the upgraded 2019 AirPods to be significantly different from their predecessors thanks to trademark and Bluetooth SIG filings, but we now know that's not the case. That doesn't mean we won't ever see these features, however. We wouldn't be surprised if Apple was saving features like biometric sensors, new color schemes, and waterproofing for the AirPods 2. Our best guess is that the AirPods 2 will be priced similarly to the current AirPods, which cost $159 / £159 / AU$249 / AED679 with the standard charging case, and $199 / £199 / AU$319 / AED829 with the new Wireless Charging Case bundled in. It's possible that the AirPods 2 will be more expensive than their predecessors, but we'd be very surprised if they exceed $200. What's new with the AirPods (2019)? Apple hasn't changed much in terms of design in it's latest update to the AirPods – instead, the next-gen improvements seem to be largely under the hood. Inside the buds there is a newly-designed H1 chip which Apple has built specifically for the headphones. It improves connectivity pairing times, the efficiency of the battery life, and allows for hands-free "Hey Siri" functionality. New for the AirPods 2019 is the wireless charging case for the earbuds, which means you can use Qi-compatible charging mats to power the case without having to stick a cable in. As for sound quality, the 2019 upgraded AirPods are no different from the ones you could get in 2016. Previous trademark filings suggest that the second generation AirPods would be a health and fitness device, in addition to being a pair of true wireless earbuds. Now we know that the updated AirPods don't have these features, we think we will see them in the AirPods 2 in 2020. Back in July 2018 Apple filed a patent for biometric sensors which would allow the AirPods 2 to take on fitness tracking capabilities like those seen in the Jabra Elite Wireless. This followed another patent filed in March, which further fueled the rumors. We also heard separately that the AirPods 2 would come in black and white, be both waterproof and offer active noise-cancellation. Another patent from July suggested that Apple was working on some pretty nifty tech for how the earbuds handle outside noise as well as dissipating pressure from inside the ear canal. It then goes on to describe how the earbuds would handle ambient noise, using a microphone to filter in noise from the outside world so that you can remain aware of your surroundings while still hearing your music. One rumor that did prove to be accurate however was wireless charging and Bluetooth 5.0 - but instead of being an improved thanks to an updated W2 chip, Apple has designed a brand new H1 chip, which is made for headphones specifically. Only a couple of years ago, companies were struggling just to get true wireless earbuds working, but now the goalposts have already shifted to packing more and more functionality into their shells. The Sony WF-1000X manage to include noise-cancellation technology inside their diminutive shells, and we were hoping see similar functionality make it to the second generation of AirPods. Apple’s fancy ambient noise technology outlined above suggested the company is thinking along these lines, and as it didn't make the cut for the 2019 upgrade, we're expecting to see noise-cancellation in the AirPods 2. Apple isn’t much of a fan of buttons, but there are some cases where they save you a lot of time and effort, and headphones are one of these instances. On-board controls have become an almost essential feature in headphones in recent years, allowing us to control music playback and volume without having to struggle to get our phones out of our pockets. Now the 2016 AirPods did allow you to control music in a sense, but they relied entirely on Siri, Apple’s voice assistant. New to the 2019 upgraded AirPods is the ability to double tap the right earbud to start your music up if it’s paused or skip to the next track if you’re currently playing a track...and that's it. We'd like to see the AirPods 2 take this further, allowing you to skip backwards and forwards more easily. What would be really great, would be to put those long stems to use and add in some swipe volume controls. Apple likes to rely wholly on sleek white plastic, but we aren’t a fan of the lack of rubber tips on the AirPods, especially when there’s no cable to catch them if they fall. We want any true wireless earbuds to feel nice and secure in the ears, and including a number of changeable ear tips so we can select those that perfectly fit our ears would be the ideal way of achieving this. One individual in the TechRadar office even went to the length of fixing some rubber tips from an alternative pair of headphones onto their AirPods to make them feel more secure. We weren't expecting Apple to change it's rather rigid design aesthetic with the 2019 update, but here's hoping it will for the AirPods 2. Given that Apple likes to ensure all its products are designed to work as a family this has little chance of happening, but we’d love to see the AirPods play slightly nicer with Android phones. On iPhones, pairing is a dream. You simply hold the AirPods near your phone and they connect more or less automatically. However with Android the process is a lot more complicated and involving jumping into settings menus to select the AirPods manually. We’d love to see Apple simplify this process for the AirPods 2, though we're not holding our breath. We get it, Apple likes white things. But in an era where iPhones and iPads are available in a range of different colors we’d love to see this same courtesy extended to the AirPods. We just want our headphones to match our phone and our Apple Watch; is that so much to ask? Although Apple has experimented with different colors for its various devices, its earbuds have always stayed the same iconic white. Still, the AirPods 2 are rumored to be coming in black.